BTC -- In good news v. bad news, it's best to get the bad news out of the way first. 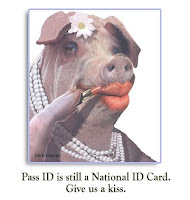 "Legislators in many states called the requirements unconstitutional, portraying REAL ID as a kind of Orwellian government effort to track citizens. American Civil Liberties Union of Iowa Executive Director Ben Stone said he’d assumed the REAL ID issue had been put to rest in Iowa after suffering defeats in so many other states. He was surprised and disappointed to learn of the rule adoption. 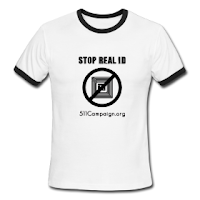 Stone said he cannot imagine why the state went to the great effort and expense of implementing REAL ID when the federal government had largely given up on the idea of implementing the legislation as originally enacted." AND NOW FOR SOME REALLY GOOD NEWS! SPRINGFIELD, Mo. -- The City of Springfield reached an agreement with plaintiffs (Positronic Industries, Oke-Thomas & Associates, Stenger Management, and Joe Robles) in a lawsuit over the City’s controversial E-Verify ordinance approved by voters last February. The plaintiffs contended the ordinance, proposed by the Ozarks Minutemen by initiative petition, was unconstitutional and in violation of federal and state law. The parties filed an offer of judgment and an acceptance of judgment. The agreement leaves intact only a small part of the ordinance, and orders that what remains are provisions that may only be enforced consistently with state and federal law. The National Institute for Standards and Technology released the five pilot award winners for the National Strategy for Trusted Identities in Cyberspace. The five were selected from a pool of 27 finalists and 186 organizations that originally submitted proposals. The American Association of Motor Vehicle Administrators (AAMVA): $1,621,803 AAMVA will lead a group of private industry and government partners to implement and pilot the Cross Sector Digital Identity Initiative (CSDII). The goal of this initiative is to produce a secure online identity ecosystem that will lead to safer transactions by enhancing privacy and reducing the risk of fraud in online commerce. In addition to AAMVA, the CSDII pilot participants include the Commonwealth of Virginia Department of Motor Vehicles, Biometric Signature ID, CA Technologies, Microsoft and AT&T. BTC - We want to endorse RT's "Breaking The Set", with an honorable mention for porting underreported privacy and identity news. Abby Martin, the news show's producer and host, is on the Board of Director's at Project Censored. Project Censored supports outing Real ID and national identity schemes as underreported or treated as managed news by Mainstream Media. For those with news interests in privacy, identity and technology, Abby Martin's reporting at "Breaking The Set" is one to watch. TRENTON — A state Superior Court judge will hear arguments Friday on whether New Jersey can implement nationally standardized drivers’ licenses. The state Motor Vehicle Commission planned to roll out the new licenses in May but was stopped by an injunction issued by Mercer County Superior Court Judge Paul Innes after the American Civil Liberties Union of New Jersey sued. Can defunding finally put REAL ID out of our misery?